McEachern’s heralded leader the past four seasons came through one final time. T’ea Cooper sealed her high school career by leading McEachern to its third state title in four years Saturday night in Macon, GA. In addition to her game-high 26 points, her leadership, timely playmaking and clutch free throws late-on a night where she struggled from the stripe, propelled the Indians to a 58-51 overtime victory over Norcross (28-5). Cooper battled foul trouble for the second consecutive title game yet remained poised throughout. Cooper picked up her third foul with 3:31 left in the second quarter with McEachern trailing 22-21. Norcross expanded the lead to 28-21 before leading 32-25 at halftime as Cooper sat the final two-plus minutes of the half. McEachern chipped away at the lead for the bulk of the third quarter before Jasmine Clements nailed a three-pointer to cap a 7-0 run closing the quarter with McEachern leading 39-37. In the fourth, Jada Lewis scored on a fastbreak layup to put McEachern up 45-39 with 5:36 remaining. Norcross battled back and knotted the score at 45-all behind a personal 6-0 run by Tylia Gillespie midway through the fourth. The squads battled from there until Norcross’ Taylor Mason drilled a three-pointer to even the count at 50-all with 61 seconds remaining. Mason then fouled Cooper with 43 seconds left however Cooper (5-12 FT) missed both free throws giving Norcross the last shot. Mason’s shot missed under duress from Tierra Lindsey, who was playing with four fouls, forcing overtime. Cooper rose to the occasion in overtime as she has throughout her career, especially this postseason. Cooper opened overtime with a bucket for a 52-50 Indians lead. Later, she assisted on a Tierra Lindsey bucket putting McEachern up 56-51 with 55 seconds left in overtime. Lindsey was fouled on the play. Lindsey missed the free throw but there was Clements for the offensive rebound. On the extra possession Cooper turned the ball over however Gillespie blew the open layup. Jada Lewis grabbed the rebound and salted the game away at the free throw line for the 58-51 final. McEachern leads the series 4-3 overall since 2010, the squads are 1-1 in title games during that span and have combined have won the last six championships in Georgia’s highest classification. “We would love for it to be a rivalry, (Norcross’ Hembree) is a great coach and if we can make it work we’ll make it work,” Arthur stated. Freshmen Chanel Wilson was the only other Indian to finish in double figures with 13 points. Lewis and Lindsey tallied six each while Clements grabbed a team-high 12 rebounds to go with four points. Gillespie led Norcross with 20 points and 13 rebounds off the bench followed by Mason with 11. Allison Johnson grabbed a game-high 16 rebounds in addition to her eight points. “She’s one of the best players I’ve ever seen,” Arthur said about Cooper. “Very high basketball IQ, unselfish, a creator. She wants it, she got it, she deserves it. Cooper (Tennessee signee) leaves McEachern winning three titles three different ways. As a freshman she guided McEachern to a 33-0 mark with power players, Dominique Wilson (NC State), Destiny Gibbs (Southern Cal) and Pachis Roberts (Georgia) defeating Hillgrove. Taylor Gordon was by her side along with Aneshia Williams (Gardner Webb) and Caliya Robinson (Georgia signee) in a win over Archer. This season she was the marquee player on an overall inexperienced team, save Jada Lewis, which held the number one ranking nationally for multiple weeks this season, before injuries hit the roster resulting in key losses. “She can win without big studs, she should be the national player of the year,” Arthur firmly stated. The saying goes it’s tough be beat a good team four times and Holy Innocents can vouch for that. The Lady Bears, ranked fifteenth in the nation, lost for the first time this season 45-31 to Weselyan in the Georgia 2A state championship game. Holy Innocents won the three previous meetings this season between the region 6-2A foes. Holy Innocents struggled from the field all game as Khayla Pointer and Sydney Long combined seven points on 2-of-24 from the field as the Bears shot 24% for the game. Leading 26-23 to begin the fourth quarter, Wesleyan’s Nikki McDonald drilled a three-pointer capping a 10-2 run over the first 4:07 of the fourth for a 36-25 lead. The Wolves never looked back as Holy Innocents would not get closer than nine the rest of the way as the lead swelled to as many as 14 and the final margin. Natalie Armstrong finished with a game-high 17 points as Lauren Frerking tallied nine while AMaya Register had seven for Wesleyan. Holy Innocents (31-1) did not have a double-figure scorer as Kaila Hubbard finished with a team-high eight points, Erika Cassell and Shai Blanding each had six each. The Jonesboro Cardinals (32-1) ascended to the top of the basketball world in Georgia for the second consecutive season with it’s 55-50 victory over Carrollton (29-3) in the 4A state championship game. The Cardinals used a 7-0 spurt behind a Tracy Hector Jr bucket followed by a James Walker Jr three-pointer and hoop for a 35-25 lead in the third quarter. Carrollton would pull to within five at the end of the third quarter for a 37-32 score heading to the fourth. Carrollton’s Jarel Rowe scored on a putback to tie the game at 39-all with just over five minutes remaining. Tracy Hector Jr again sparked a Jonesboro run scoring a bucket and getting fouled. He missed the free throw but Jonesboro got the rebound and Hector Jr scored again and was fouled. He again missed the free throw and Jonesboro again got the rebound and finished the possession with a Tracy Hector Jr tip-in for a six-point possession and a 45-39 lead with 3:44 left. Carrollton would not go down easy pulling to within one on a Donate Bonner three-pointer with 4.3 seconds left. From there Jonesboro’s Walker Jr closed the game making four consecutive free throws for the final 55-50 margin. Walker Jr finished with 21 points while Tracey Hector Jr filled up the box score with 20 points 10 rebounds and 7 steals.Hector Jr turned three of those seven steals directly into points on the other end. As a team Jonesboro forced 17 Carrollton turnovers scoring 24 points off of them. Austin Donaldson added 10 for the Cardinals. Jonesboro ends the season with a 31-game winning streak, 5-1 vs non-Georgia opponents, did not lose to a Georgia opponent this season and look to finish in the Top 10 of the Max Preps Xcellent 25- they are currently ranked eighth. The Cardinals only loss this season came to second-ranked Montverde Academy (FL) in the second game of the season. Monate Glenn lead Carrollton with 22 points (14 in the first half) and 11 rebounds. Cooper Criswell finished with eight while Dontae Bonner and Desmond Webb each had seven for the Trojans. The Holy Innocents Lady Bears will play for the Georgia class 2A this week as the No.15 team in the latest Max Preps Xcellent 25 national rankings. The Lady Bears (31-0) defeated Pelham 78-70 in the semifinals, setting up a fourth meeting this season against Wesleyan in the finals. Wesleyan (24-7) has won state titles in Georgia classes 1A and 2A nine of the last eleven years. Holy Innocents last won a state title in 1999. Holy Innocents swept both regular season meetings against Wesleyan and won in their region tournament meeting. The Lady Bears boast an impressive schedule in which they went 5-0 against non-Georgia teams. Of those five wins, four of them came against teams that won multiple playoff games in their respective states including Goose Creek (SC) defeating Irmo (SC) in the 4A semifinals. Sparkman (AL) was the only non-Georgia team Holy Innocents faced that did not win a playoff game in their state. Sparkman lost to Hoover (AL) in the Alabama class 7A regional semifinals, Hoover was knocked out in the regional finals. Holy Innocents posted victories over quality Georgia teams including previously No.1 ranked McEachern (24-6; GA-6A), Southwest Atlanta Christian (28-3; GA 1A-Private) and Goose Creek (22-6; SC-4A). All of those teams are playing for state championships this weekend. McEachern will take on Norcross (28-4) in the Georgia 6A finals, Southwest Atlanta Christian-which boast a roster of only six players, will take on St. Francis (27-3) in the Georgia 1A-Private finals while Goose Creek (SC) will take on Spring Valley (25-4; SC) in the South Carolina class 4A finals. The Jonesboro Cardinals (31-1) moved up two spots in the latest Max Preps Xcellent 25 national rankings from No. 10 to No.8. Jonesboro advanced to the Georgia 4A state championship game with a 71-43 victory over Liberty County. The Cardinals are seeking its second consecutive state championship when they lace them up against Carrollton (29-2). The Wheeler Wildcats (29-2) remained at No. 5 in the rankings after a 74-64 victory over Tucker in the class 6A semifinals to advance to the 6A finals. Wheeler, last years runner-up, will take on Pebblebrook (27-5) in the finals. Despite an impressive out-of-state schedule, the Falcons have been unable to crack the rankings. Their strength-of-schedule took a hit when previously ranked No.19 DeMatha (MD) fell out of the rankings this week after losing three of its last five games. The Cedar Shoals Jaguars pursuit of a first-ever state championship game appearance and possible title ended on Saturday at the hands of the Brunswick Pirates. In a nip and tuck game from start to finish Brunswick (28-2) prevailed 44-43 after Cedar Shoals was unable to get off a last shot attempt with three seconds remaining. The Jaguars took a 34-33 lead into the fourth quarter after trailing 17-15 at the break. They were outscored by the Pirates 11-9 in the final frame, ending a season in which they were region champions and posted a 3-0 record at home during the state tournament. The loss also snapped a six-game winning streak. All total Cedar Shoals went 6-1 in postseason action and finished the season 23-9. Brunswick’s Roger Davis accounted for 45% of the Pirates scoring finishing with 20 points, putting his team on his shoulders in the second half points with 16 of those points. Greg Smith tallied 11 points while senior stud D’andre Mahaffey finished with 10 for Cedar Shoals. Those breaks included D’andre Mahaffey nailing a game-winning three-pointer in the second round against Northside-Warner Robins and a game-clinching tip in ‘And 1’ to seal a quarterfinal victory over M.L. King. The Jaguars defeated Kell by 22 points in the opening round, from there it was nip and tuck as their final three state tournament games were decided by a combined six points (defeated Northside-Warner Robins by one, M. L. Kinh by four and lost to Brunswick by one). Mahaffey and Patrick Scott are the only seniors that saw meaningful action this season that will not return. Phlandrous Fleming, Greg Smith and Jerrick Mitchell will are three starters that will return next season while others gained valuable experience this season and could expect their roles to increase. In five seasons as head coach L’Dreco Thomas has lead Cedar Shoals to two region championships and the semifinals so the future looks bright as expectations have risen. It is Cedar’s most successful run since earlier in the 2000’s which included their last semifinal appearance in 2003. The McEachern Indians were staring elimination in the face with just over five minutes remaining. Trailing by ten to Archer (26-6), the Indians put together a 10-0 run over the next two minutes to even the game at 52-all. From there both team went back and for exchanging the lead and were tied several times. McEachern turned to their playmaker T’ea Cooper on the final possession. Cooper drove left of the lane and hit a scoop shot as time expired (via @keethetrainer) to put McEachern in the finals for the third time in four years. The McEachern bench ran onto the floor and mobbed Cooper during the mass celebration. The latter proved to be the end result as Arthur didn’t move on the sidelines after the made basket and celebration commenced until an assistant coach gave her a celebration hug. Cooper finished with 15 points-11 in the second half, Tierra Lindsey put in 12 and Jada Lewis finished with nine as the Indians ended Archer’s season for the second consecutive season. Archer was paced by senior Madison Newby who finished with a game-high 18 points while her sister Autumn posted a double-double with 12 points and 19 rebounds. McEachern (24-6) will face Norcross (28-4) in the class 6A finals next Saturday night in Macon, Ga. Norcross earned their spot by defeated Parkview 53-35.Norcross and McEachern have combined to win the last five state titles in the highest classification. Norcross has won three titles, McEachern has won two and are the defending champions. Since 2010-11 the teams have split six meetings,once in the finals as Norcross won big 61-36 in 2011. 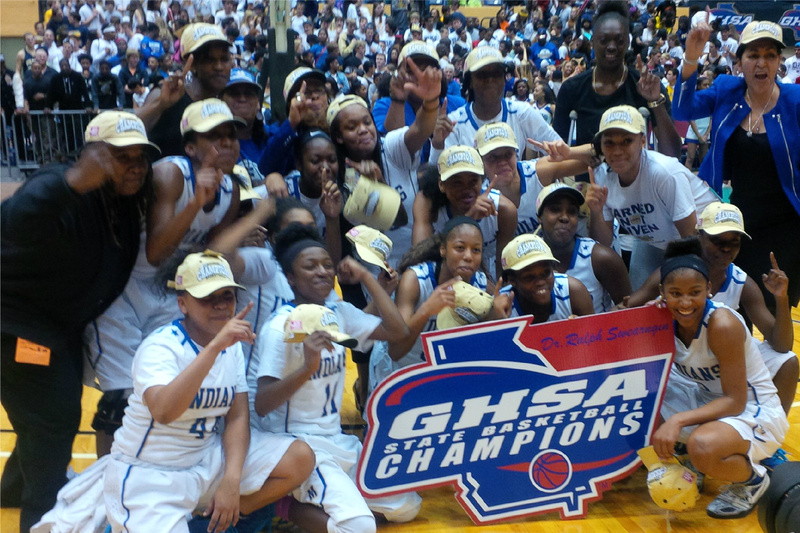 McEachern defeated Norcross 64-61 in the semifinals on their way to their first championship in 2012. The teams have not met since McEachern also won their previous regular season meeting 50-48 during the 2013-14 season. Nationally neither team is ranked. McEachern ascended to the No. 1 spot at one point this season but fell out in January after multiple losses. Both teams posted 5-1 records against non-Georgia teams this season.